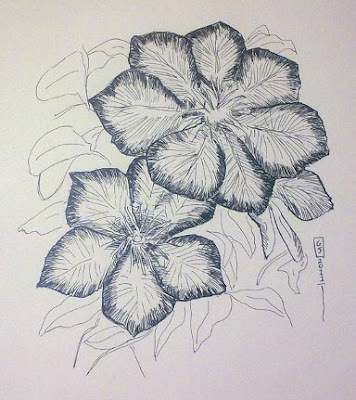 As I explore the exotic world of dip pens, each day I discover something amazing. 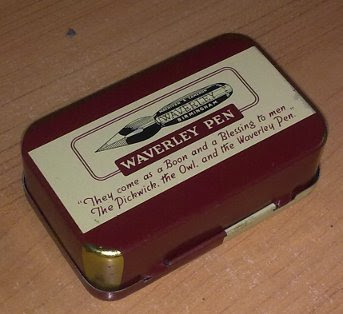 One such gem of a pen is the Waverley from Macniven and Cameron. As part of an assorted set of nibs that I got on Ebay, this nib has a very unique design. 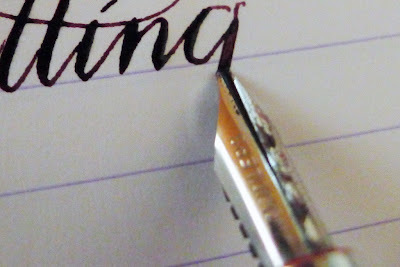 The plume of the nib is bent in an interesting manner, perhaps to hold that extra bit of ink, and also a very smooth point that prevents paper from catching the nib. Dipping it into a bottle of dense black Pebeos Incre De Chine, which also happens to have a nice sheen, the pen produces very thin strokes smoothly. There isn't a great amount of flex, though I could get a good bit of variation in width. 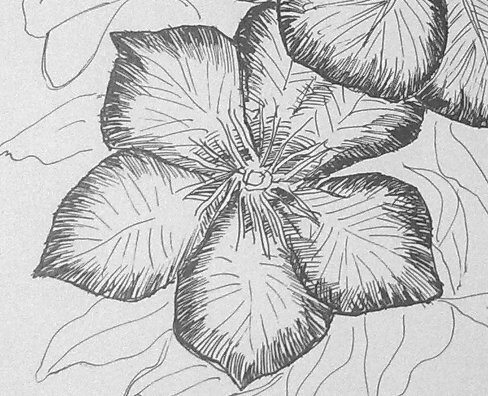 The pen is very feathery and felt like I was drawing with a metal brush, having a nice bit of springy-ness. 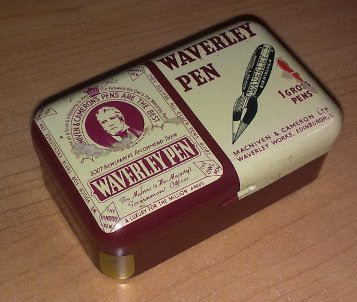 An interesting story related to this specific nib is that, Sir Walter scott, used this pen for a series of novels, known as the Waverley novels. They were named after this pen, since he used them to write the stories! I was so attracted to this Waverley, I went ahead scouted for more and got lucky. I found an awesome seller in France who sold them by the gross, in its original tin box ! How much better can that get?! 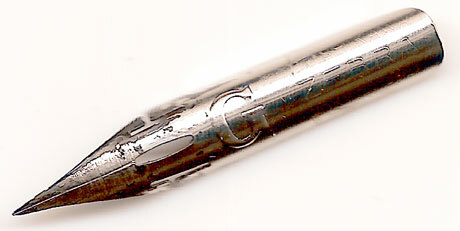 The slight upturned point that resulted in a smoother pen tip, has resulted in the name Waverley being associated with any nib that is of such design. There are fountain pen nibs that have the same design and are known as Waverly pens! For me though, I would like to stick with these lovelies! I finally got it! After a long wait for the pens to be available and placing my order at two different sources, I finally got hold of the much talked about pen. I filled it up with my brand new bottle of Rotring brilliant blue, and started to put ink to paper. This is quite an amazing pen. has a great range of line width, writes absolutely smooth, and it is pretty small, and compact and is very comfortable to use. I have seen folks use indelible black inks such as the Noodler's Bulletproof Black, and Platinum Carbon Ink. I will probably hold off till the newness of the pen goes away before attempting to do such a thing. To get this flex from a fountain pen was something very different to experience. The Rotring ink is a very beautiful blue, didn't come out well in the mobile shot above. Its a Violet-ty brilliant blue. 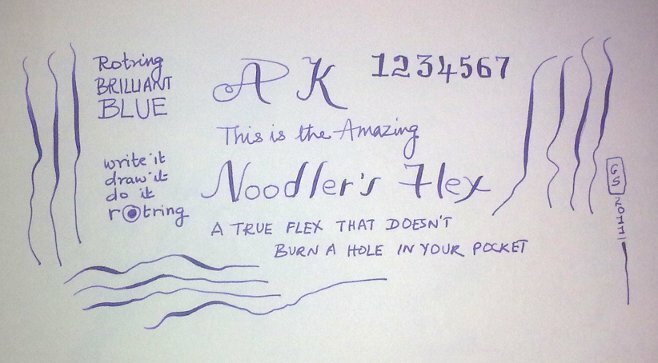 Folks with experience using vintage flex fountain pens must be able to critic the Noodler better. My comparison is based on dip nibs, which are quite a different thing. What I love about dip pens, are the really super thin points they can have, and the high amount of flex. For instance an Hunt 100 nib, can produce an almost invisible line, that can flourish into a very thick swell, and back to the hairline again, without dragging along from the swell. That adaptability, is missing, partly due to the ink. The India ink has a certain density, that allows the flexibility of line width, which goes from hairline to a swell and back to the super thin immediately. fountain pen inks are generally more fluid, and hence cannot swing back to the thinness without dragging out a little from the thick stroke. What is amazing about the pen is that , this time around all the pens got sold in first few days. and the clear demonstrator version sold out at Gouletpens in like three minutes !! I can believe it. The other source for my Noodler's flex is good old Greenman508 who by the way seems to have couple colors left at the time of this writing, and so does ISellPens. It was almost like First Day First Show. Great to see a fountain pen creating such as flutter. I think this is a great pen, to create some amazing writing and drawing. And if anything it can serve as a great means of practicing penmanship, before graduating to dip pens and India Ink if needed. I had briefly written about how great dip pens are. I am just now beginning to discover how amazingly superior the dip pens are. I was introduced to dip pens through a Gillott 303 when I was a kid and learning art as part of a mail based art study program. The dense black India ink and the simple yet super fine nib was very intriguing. Time went by, I forgot all about it. Following my recent exploration of pens, I got hold of a few fabulous sets of nibs thanks to Ebay and dedicated forums such as the Fountain Pen Network and Stutler's Sketching Forum. We have come a long way from the quills of birds, to bamboos, to dip pens, to fountain pens, and on to ball point, Gel, Felt tips and so on. While there is an apparent progression in terms of more ease of use, portability etc, the flexibility and amazing line quality of the dip pen eludes all modern day pens. Due to the simplicity of the mechanism, and the absence of any restriction whatsoever on the shape and form of the nib, they came in a wide variety of shapes. Dip pens were primarily made in Birmingham, beginning the early 1800, which was also known as the first manufacturing town. In its hay days, each pen factory in Birmingham seems to have produced around 30,000 pens(these nibs were called as pens in those days), and it employed women and simple hand press tools. This resulted in a amazing drop in price leading to the access to writing tools for the masses which some attribute to the increased literacy and literature. Though the days of dip pens are long gone, there does seem to be available a limited supply of the nibs. Though these nibs were primarily made for writing, pretty soon the drawing community began making use of it. Engineering drafting as well as pen and ink artists began to make use of it increasingly. The dip pens also came in great flex, which aided in ornamental writing, which had great variation in line width. there were business pens that were pretty stiff with uniform lines. There was also a variety called the Manifold nib which was hard enough and used to produce as many as five carbon copies. Then there were the so called School pens. Which were generally medium point, and for the beginner. Joseph Gillott and Esterbrook were two companies that produced some great pens for drawing. Gillot's # EF, 303 , 170 and #1 Principality offered a complete solution for the artist. they together offered very fine, very flex to medium fine and medium flex. Esterbrook had equivalents 356, 357, 358 and so on. Gillot was the pioneer in mass production of steel nibs, and Esterbrook brought that to the United States. Carl Barks the famous Donald Duck cartoonist used an Esterbrook 356 for his inking. In the hay days, the dip pen nibs were made in several countries, beginning in England, France, Germany, Belgium, Italy, Russia, United States and all the way to India, Japan, China and more. Today one can still obtain nibs made from a variety of countries. Outside of the famous name brands there are plenty of interesting nibs. Nibs generally came in a gross. 12 dozen per box. The reason being these were more commonly used in public places such as the Bank, Post office etc., and an average consumption would be about a gross a year. Some say, due to the fact that these nibs corrode easily if not maintained, even an individual needed more than a handful over a period of time. While the Gillot and Esterbrook nibs for art work were of a certain size, there was a much larger Falcon variety. This had the shape of the beak of a falcon, came in large size and could hold tons of ink. Esterbrook, Perry & Co and almost every manufacturer made them, and they are such a delight. Today dip pens are still manufactured primarily in the Manga world. Companies such as the Tachikawa, Nikko and Zebra makes clones of the most popular art nibs of the yesteryear. These are made of stainless steel and most likely last longer. The most popular being the G-pen. Best source for these nibs is Ebay, while there are also several specialized stores such as Pendemonium. If you are lucky you might pickup a gross for under 5 dollars! This is just the tip of the iceberg. As more NOS nibs from around the world arrive, I shall report my findings more. For learning more in depth about dip pens one should take visit to IAMPETH. Ever wondered how those beautiful written texts of the past were written? There is a certain charm in the manner in which these were written, there was a rhythm, there was a graceful flow, a very expressive tone, and when looking at them now, produces almost a mystical look. Often time we wonder , maybe it was the talent of the writers, with such gifted handwriting, which probably is too difficult to acquire. No question about the talent of the hand that wrote those beautiful texts, but no matter how hard one tries, unless the tool is right it will never be as good. Apart from the style and grace of the hand, the variation in the width of the strokes is the key ingredient and the secret behind the expressive variable width is the Flexible nib of the pens that was used to write them. Of course these were not written with modern ball point pens or roller gel pens. Even the flat edges Calligraphy pens can only come close. In olden times pens were in the form of nibs set in a holder and dipped in bottles(ink wells) of ink and used. The simplicity of the mechanism also meant a flexibility in the kind of ink one can use. The ink can be pigment based (opposed to modern dye-based inks) and hence can be very dense and non-feathering, waterproof and indelible. 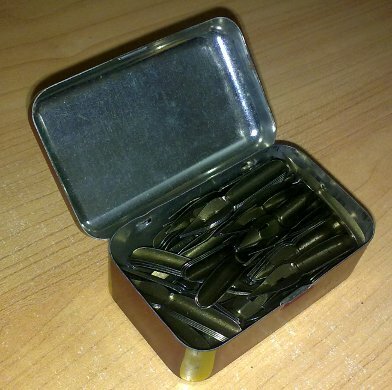 Apart from that advantage, the nibs can be of varying types. very thin to thick, and from very stiff to very very flexible. 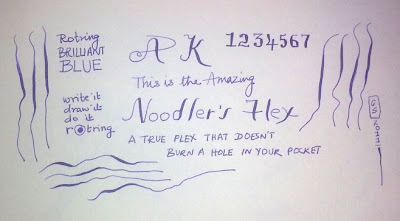 The Flexible nibs again varied from Flex, to semi flex and no flex and everything in between. These flexible nibs were capable of producing lines of varying thickness based on the amount of pressure exerted on them. some nibs such as the Hunt 100 is so thin, yet totally flexible that it can produce very huge swells if pressed even slightly. Some such as Gillott 404 and Gillott 303 had manageable amount of flex. Using these a very interesting and varied types of text can be produced. The style and grammar of such handwriting evolved and one can see styles such as Spencerian or Copperplate as being more popular. 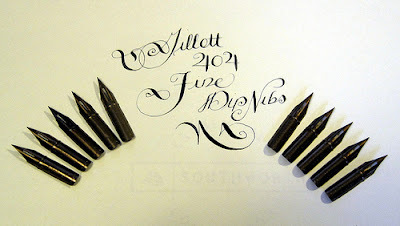 As dip pens gave way to fountain pens (we are still talking of 'ancient' times), the flexible nibs became a speciality. It was a challenge to produce flexible nibs that can work inside a fountain pen's feed mechanism. Gold was the most suitable since it can flex without breaking, and also at the same time resistant to corrosion, since fountain pens stayed wet even when not in use. Hence it became expensive to have flexible nib fountain pens, and slowly the flex nib along with the fountain pens faded away from public memory. Of course it did not fade away from everyone, and there always existed a set of individuals passionate about handwriting, flexible nibs, and what not, and they continued the tradition, however with limited supply of vintage flex nib fountain pens, which became more and more expensive and certainly into the hundreds of dollars. One always had the choice of using a dip pen. but it always comes with its own disadvantages, such as lack of portability and increased maintenance. The increased interest in Manga, has re infused the enthusiasm in dip pens , and there is a specialized set of nibs from Nikko, Tachikawa and Zebra such as the G-Pen, which offer great flex capabilities. One can still get Gillott, and from other manufacturers such as Leonardt, and Brause. Most recently the intriguing company called the Noodler's Ink company has introduced a beautiful flex nib fountain pen that has satisfied the cravings of a flex nib enthusiast, at a price that won't pinch the pocket. All of these is recent knowledge to me, and it was a great liberating experience to take a flexible dip pen, dense India ink, and produce some very interesting vintage style text with expressive strokes. Some of the resources that helped are the Fountain Pen Network, Russ Stutler's Sketching Forum and countless blogs from great folks. If you want to know all about Penmenship, the only place you ever want to go is IAMPETH. And of course you need your choice of dip pen, or fountain pen with a good flex nib and a bottle of beautiful ink, and endless supply of paper. Next time you want to send a handwritten note, or a little note on the tiny little card on the gift, you are better equipped.